The army also foiled infiltration attempt of militants in Gurez sector in Kashmir by killing two militants. SRINAGAR: Two soldiers were killed in Pakistani troops firing at Line of Control (LoC) in Jammu and Kashmir while over 200 students and teachers were rescued after being trapped in buildings due to shelling from across the Line of Control (LoC) in border district of Rajouri in Jammu and Kashmir on Tuesday. Defence spokesman in Srinagar, Colonel Rajesh Kalia, said Pakistani troops resorted to unprovoked firing on army positions along the LoC in Nowgam sector of Kupwara district this afternoon. He said the army men deployed at LoC effectively returned the fire. A soldier was killed in the Pakistani troops firing, Kalia said. Sources identified the deceased soldier as Rifleman Vimal Sinjali of 4/1 GR. They said the firing between troops of two sides continued till evening. Meanwhile, Pakistani army also breached border ceasefire in BG sector of Poonch and Naushera sector of Rajouri districts today. Defence spokesman in Jammu, Lt Colonel Manish Mehta said Pakistan army resorted to unprovoked firing and mortar shelling on army positions and civilian areas in BG sector of Poonch from 6.45 am. He said the Pakistani troops fired from automatic weapons and resorted to mortar shelling on army’s forward posts in Naushera sector of Rajouri district from 1.50 pm. Mehta said at both the places, army men effectively returned the fire from similar caliber weapons. He said Sepoy Jaspreet Singh, 24, was grievously injured in Pakistani troops firing in Naushera sector. The injured soldier was evacuated to hospital, where he was declared brought dead. Jaspreet belonged to village Talwandi Naliyan, District Moga, Punjab and is survived by parents. Due to Pakistani troops firing and mortar shelling, about 217 students were trapped in three schools at Kadali, Sehar and Bhawani area close to LoC in Naushera sector Rajouri, an official spokesman said. He said all 12 students trapped at Primary school Kadali were rescued by administration with the help of locals amid heavy shelling from across the LoC. The official said five bullet proof armoured vehicles of police and Army were used to evacuate the trapped students. “After hectic efforts, 150 students stuck at Government High School Bhawani were rescued and shifted to Nowshera. Similarly, 55 students and teachers stuck at Government High School Sair were rescued amid heavy shelling,” he said. The official said Sair school was badly damaged due to Pakistani shelling. He said in view of Pakistani firing and shelling, all schools in Nowshera and Manjakote sector have been closed till further orders. Meanwhile, army foiled an infiltration bid of militants in Gurez sector of North Kashmir’s Bandipora district today. An army official said army men deployed at LoC in Gurez sector detected a movement of militants early this morning. He said the militants fired from AK-47 rifles towards the army men after being signaled to stop. “The fire was returned by the troops and in the ensuing encounter two militants were killed,” he said. The official said after the gunfight ended, army men launched search operation along the LoC. He said during the searches, three weapons were recovered. The combing operation was going on when reports last poured in, added the army official. 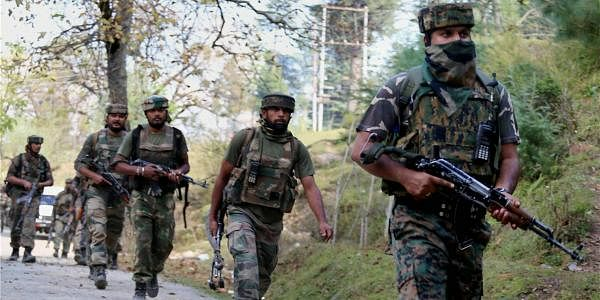 The security forces also killed three Lashkar-e-Toiba militants during a brief encounter at Sheikh Mohalla-Watergam near Bulbul Nowgam in south Kashmir’s Anantnag district last evening. The slain militants were identified as Showkat Lohar, Muzaffar Hajam and Naseer Ahmad, all locals.